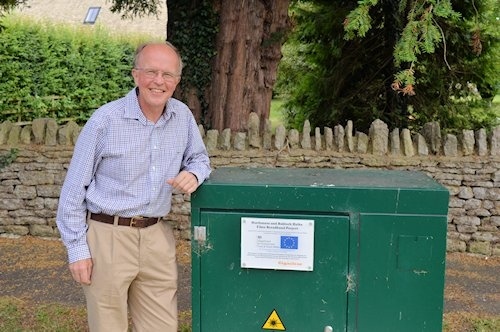 Last year hundreds homes in the rural West Oxfordshire parish of Northmoor celebrated the arrival of Gigaclear’s new 1000Mbps capable Fibre-to-the-Premises (FTTP) network. Today we’ve done a quick follow-up interview with the ISP and a local councillor to see what kind of impact it’s had. The new network, which also included Moreton, Bablockhythe and was one of the few AltNet ISP schemes to successfully obtain EU grant funding (£186,000) under the Government’s Rural Communities Broadband Fund (RCBF), was officially switched-on by the Prime Minister, David Cameron, in late August 2014 (here). Prior to the new network most locals only had access to very slow BT based copper-line Internet connections and so it’s perhaps little surprise that Gigaclear’s network, within its first year of operation, has already achieved a local take-up level of 40% out of 542 premises covered. At this point we wanted to go back and see what kind of impact the network has had on Northmoor and happily the local councillor, Graham Shelton (pictured), was only too happy to help. We’ve also managed to rope in Gigaclear’s CEO, Matthew Hare, who has kindly helped to answer some of our questions. Q1. Why choose Gigaclear and not BT? We were fortunate to have the help of West Oxfordshire District Council, which helped us put the project out to tender to a number of broadband providers. Gigaclear was the head and shoulders clear winner of the procurement process that we undertook, because they had a better business plan by miles, and could give everyone ultrafast broadband without the need for multiple cabinets dotted around the village or unsightly radio masts. We connect up to the national spine under the Thames and across to Appleton, with each house having its own small buried fibre box outside to give residents access to the network. Q2. How has the village changed since the service was installed? The Gigaclear FTTP service was installed quickly and with very minimal disruption. We have had good take up of the service. Many at Bablockhythe now have reliable cost-effective broadband access for the first time. In the rest of the village, speeds are very significantly faster and consistent for both up-loading and downloading data compared with before. We have residents in the village from all professions, but for those who work from home, having Gigaclear has been invaluable. One of our residents is James Harrison, who works for a large media research organisation in London. He is now able to upload and download the very large data and video files needed to perform his job quickly, meaning he can be significantly more productive when working from home. At parish council meetings we can now go online and look at planning applications, and this has helped us to become much more connected to our colleagues on the District Council. We also envisage other uses at the hall, including an internet café and computer teaching resources for older people. It’s also socially transformative. One of the benefits of having more people in the village in the daytime, thanks to the better broadband, is that more people go for lunch at the community pub for lunch, which is thriving as a result. Visitors can sit in the beer garden and send and receive emails, Skype friends and download films, all at the same time. It’s just amazing compared to how it was. Isolated farms can upload and download DEFRA data, more people can shop and bank online, download movies and play games online, and young people, and indeed everyone, can have more reliable access to online educational resources. Our community pub has free wifi, which attracts more customers. Q3. How many premises have connected to the service (uptake) and how many are within reach? Today, every property has a connection point to Gigaclear ultrafast pure fibre broadband, including the most geographically isolated properties. This includes all the properties on the mobile home park – that’s a total of 542 properties passed with live fibre. Currently approximately 40% of the fixed/static properties are signed up. Q4. What was the total cost of deployment, either as an overall total or per premises figure? Do you consider it good value for money given the alternatives? The average per premise cost was approximately £800. The investment has meant that residents in Northmoor get reliable internet speeds from 50Mbps to 1,000Mbps, both up and down, from as little as £38.80 per month with no additional line rental cost. This is much better value compared to other fibre broadband solutions as this FTTP solution is designed to last around 50 years and already delivers Gb [Gigabit] speeds. The same physical infrastructure will deliver 10’s or 1,000’s of Gb when required. The only alternative available to Northmoor would have been to pay for a fibre to the cabinet (FTTC) upgrade. However this would only have delivered what other FTTC customers get today around the country, which is up to 80mb down. Q5. We understand that Gigaclear’s new network has also resulted in the development of plans for a business centre in the village hall, can you tell us a bit more about this? Our Village Hall is a central pillar of our village community, along with the Community Pub and the Church. Now we have a fibre connection to the hall we are exploring a number of developments. One of these is to create a microbusiness centre with a video-conferencing suite, enabling more people to work more often in the village instead of having to commute often long distances thus creating a more vibrant community of people who spend more time together, including having lunch in the pub! This is important for business, as we are set to lose some sites to housing that have previously housed workshops and businesses. We believe that the replacement of these old businesses with new modern businesses will make our community an exciting example of forward-thinking rural development. Q6. What sort of other village developments might you imagine the new network could foster going forward? We are a very lively community with a good reputation for getting things done. You’ll have to watch this space for other developments. Q7. Given your experience of seeing this network deployed in Northmoor, what advice would you have for other villages that might be considering the same approach? In terms of gaining funding my advice is that you have to lobby really hard, and you have to have enough of a business plan to be sure that your enterprise can sustain itself beyond the initial honeymoon phase. In terms of the roll out from Gigaclear, the broadband has really brought the community together. The parish of Northmoor, Moreton and Bablockhythe is spread over a couple of miles, but now we have much closer relationships. We’re very fortunate to have an energetic village that’s not afraid to move forward and do things; all while recognising our peaceful rural character and wanting to preserve it. From the outside it’s seen as a sleepy place with a leisurely way of life, but now with ultrafast broadband we’re thriving! Gigaclear is also going from strength to strength and we’re proud to be part of that. It’s worth pointing out that Gigaclear has since gone on to secure several major Broadband Delivery UK linked contracts, such as one for 6,495 premises in rural Gloucestershire (here), another for 4,500 premises in Essex (here) and also another one for Berkshire (here). And they are under an obligation to offer wholesale. Just be nice to see how seriously they are taking that obligation – eg are all the customers in that area Gigaclear retail, or are some using other ISPs. Fluidata can provide access to the wholesale Gigaclear offering though their Service Exchange Platform. When are they coming down to Devon? The gigaclear villages have now got a futureproof connection that can cope with whatever comes next. Those on FTTC are stuck on copper phone lines, with a limit to what they can do. They are already obsolete. Fibre is the future. Also FTTC does nothing for those on long lines, so they are left behind on sub meg or offered rubbish satellites. Well done gigaclear. FTTP – Real investment in gigabit infrastructure. FTTC – Billions of investment in BT core network but users still tied to copper and carrier. Frankly anything is better than ADSL but FTTC is a product designed to navigate Ofcom scrutiny, gain BDUK investment and keep shareholders happy. Cell tower planning, exchange and cabinet public investment should leverage a far better legacy to the public than it currently does. If public investment is directly linked to £/Mb than we might see more gigabit connections. Maybe Ofcom should consider opening up exchanges and masts to community internet access schemes.